We participate in conferences, congresses and events to promote Social Innovation in different sectors of society. We generate knowledge through our publications and collaborative research in the field of Social innovation and Social Leadership. Through our blog www.innovationforsocialchange.org we share experiences and Social Innovation resources. March 2013. “El Ecosistema de la Innovación Social en España”. Encuentro Europeo Universitario de Emprendedores Sociales. Madrid. January 2013, “Social Entrepreneurship and Business at the Bottom of the Pyramid“. CDI. Rio de Janeiro. Brasil. February 2012. “Public-Private-non-for -profit partnerships for development”. Co-development Congress for Mali. Organised by the Mali Delegation in Spain and Madrid Government. Madrid. June 2011. Formación ejecutiva para directores de insitituciones de microfinanzas.Organizado por Fedecrédito Salvador y financiado por el Banco Interamericano de Desarrollo. Cartagena. Colombia. Julio 2011. May 2011. Leadership training for Students participating at the Emzingo Project. Instituto de Empresa. Madrid. “Leading projects in International financial institutions”. 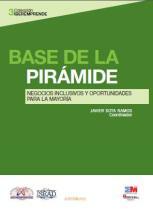 ¨Business at the Bottom of the Pyramid, inclusive businesses an social entrepreneurship¨. 3rd book published by Fundación Iberemprende and Fundación ISEAD. This book presents innovative business models to include the poorest communities (Bottom of the Pyramid) in the value chain. It includes examples and business cases of companies that have implemented innovative solutions creating both economic an social value. Fundación de Estudios Financieros – ESADE . Libro Las economías emergentes y el reequilibrio global: retos y oportunidades para España . Co-author of the Chapter: The role of International Financial Institutions in emerging markets: Implications for FONPRODE in Spain. This book introduces de challenges an opportunities for Spanish companies and banks in doing business in emerging markets. The article presents innovative financial instruments that can be introduced and implemented at regional level to promote private sector growth. It relies on the power of Small and Medium Sized entreprises as key agents in employment creation, innovation and economic growth. 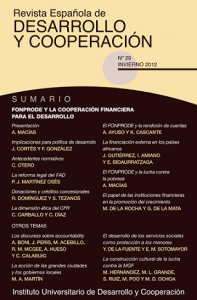 The article can be downloaded here: Articulo nuevos instrumentos financieros. Cinco Dias. Article: “New European Programme for Social Change and Innovation“. (Published the 29th of march). Cinco Días. “Las microfinanzas, un nuevo activo financiero” (20-10-2007). “The raising role of development finance institutions as promoters of economic growth in developing countries; institutional models” .